Getting the message out is essential and the color pink is a marketing genius to bring awareness to such a good cause. I purchased several items today and all of the clothing I bought from the official race gear area because the proceeds go to the race cause – The Mayo Clinic and Women Living with Breast Cancer. So many times we go to expos and spend hundreds of dollars profiting the retailers at the expo. No complaints to free commerce. But when the same dollars can help such a great cause, count me in. Two friends who have greatly impacted my life are breast cancer survivors. My training partner and one of my best friends since I was a teenager. One in eight women will be diagnosed with breast cancer and men are not immune either. It is much more rare, but one in 1,000 men will be diagnosed with breast cancer. We can do simple things for early diagnosis which increases survival rates – self breast exams and regular mammograms. This is my second year participating in the event which is celebrating the 5th year. An interactive display is made up of messages boards each displaying a motivational word and people sign the boards for display in the finish area. We went to the Believe board and wrote in green. 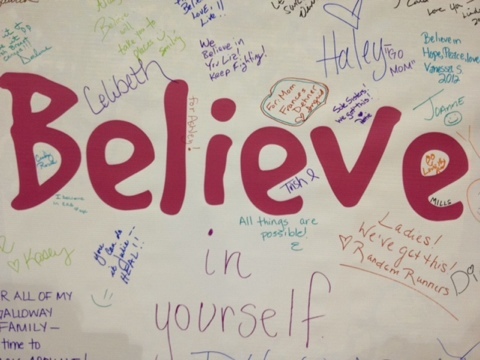 If you look closely at the picture above under the second “e” I wrote “All things are possible!” And reaffirming my mantra – believe, believe in myself – my training partner wrote below the “B” that she believes in me. How blessed am I – an amazing woman, mother, friend and eleven year breast cancer survivor believes in me. I am in the Pink. Have a great race and good luck!! I would say good luck, but execution has very little to do with luck and everything to do with preparation. I know you have put the time and effort into preparing, so I am quite confident that you will do well. Just run your race. I will be thinking of you.